Over 100 musicians, artists, scholars, union members and activists, as well as 35 social justice organizations, have called on the Philadelphia Orchestra to cancel its planned June tour in Israel. Inspired by the global cultural boycott that helped end Apartheid in South Africa, Palestinian civil society has called on international cultural institutions not to perform in Israel as a popular non-violent means to pressure Israel to end its occupation and apartheid policies. The Philadelphia Orchestra’s claim that their performance in Israel is “cultural diplomacy,” not “a political mission,” is undermined by their own admission that the trip is "in celebration of its [Israel’s] 70th anniversary” and by their close collaboration with Israeli government officials, before the trip and in the planned itinerary. The orchestra has several meetings planned with high level Israeli politicians and military personnel, including a "VIP visit" to a military base! This is the same military that has killed or wounded over 3000 unarmed Palestinians in the span just the last two weeks since March 30. At least 773 people, defenseless and demonstrating on their own land, were shot with live ammunition by snipers in ONE DAY. Such examples of Israel’s contempt and wanton destruction of Palestinian life are precisely the sort of abuses with which The Philadelphia Orchestra will be associating itself in making this trip. 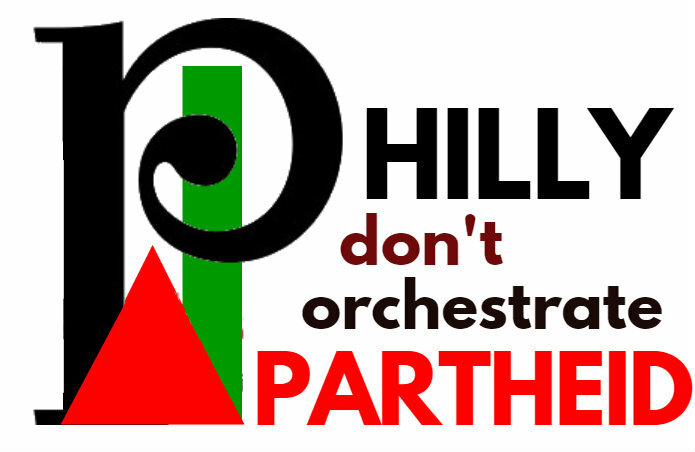 Philly: Don't Orchestrate Apartheid! Cancel the trip to Israel!